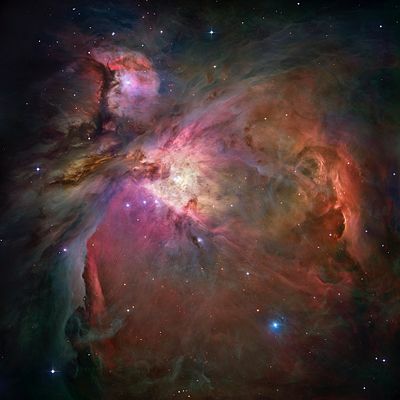 The Orion Nebula is a large cloud of gas and dust in which many new stars and potential planetary systems are being formed. More than 140 molecular species have been detected in this nebula. Astrochemistry, representing an overlap of the disciplines of astronomy and chemistry, is the study of chemicals found in outer space, including their identity, formation, interactions, and destruction. More specifically, it involves studies of chemicals in molecular gas clouds present in the interstellar medium beyond the Solar System. The study of chemicals within the Solar System is usually called cosmochemistry. So far, astronomers have discovered more than 140 types of chemicals in interstellar space, including molecular hydrogen, water, ammonia, carbon monoxide, and various alcohols, acids, aldehydes, and ketones. They have also found species that would be unstable on Earth. Given that molecular clouds in interstellar space are regions where stars are formed, studies of the chemistry of these clouds can reveal the mechanisms of star formation. In addition, some researchers are looking for amino acids and other chemical building blocks of life in interstellar clouds, which could have implications for the mechanisms of the origin of life on Earth. For studies in astrochemistry, scientists use telescopes paired with spectroscopes to measure various properties of bodies in space, such as their temperature and composition. Various characteristics of molecules are revealed by their spectra. Thus, by using spectroscopic analysis, researchers can determine the types of molecules in astronomical bodies, such as a star or interstellar cloud. However, there are limitations on measurements due to electromagnetic interference and, more problematic, the chemical properties of some molecules. For example, the most common molecule (H2, hydrogen gas), does not have a dipole moment, so it is not detected by radio telescopes. Much easier to detect with radio waves, due to its strong electric dipole moment, is CO (carbon monoxide). At one time, the space between stars was thought to empty. Thus when radioastronomy was developed in the 1950s and 60s, astronomers were surprised to discover an abundance of molecular hydrogen in the interstellar medium. Since then, more than 140 types of chemicals (including radicals and ions) have been reported so far. They include water, ammonia, carbon monoxide, and various alcohols, acids, aldehydes, and ketones. Given the sparseness of matter and other conditions in interstellar space, molecules and molecular ions that are unstable on Earth can be highly abundant in space. One example is the presence of the protonated molecular hydrogen ion, H3+. Because molecular clouds in interstellar space are regions where stars are formed, studies of the chemistry of these clouds can reveal the mechanisms of star formation. Some scientists have claimed the detection of interstellar glycine, the simplest amino acid, but this claim has stirred considerable controversy. However that may be, researchers are continuing to look for amino acids and other chemical building blocks of life, as the detection of such molecules in the interstellar medium would have implications for the possible mechanisms of the origin of life on Earth. Astrochemistry overlaps strongly with astrophysics and nuclear physics in characterizing the nuclear reactions that occur in stars, the consequences for stellar evolution, as well as stellar 'generations'. Indeed, the nuclear reactions in stars produce every naturally occurring chemical element. As the stellar 'generations' advance, the mass of the newly formed elements increases. A first-generation star uses elemental hydrogen (H) as a fuel source and produces helium (He). Hydrogen is the most abundant element, and it is the basic building block for all other elements as its nucleus has only one proton. Gravitational pull toward the center of a star creates massive amounts of heat and pressure, which cause nuclear fusion. Through the process of merging nuclear masses, heavier elements are formed. Lithium, carbon, nitrogen, and oxygen are examples of elements that are formed in stellar fusion. After many stellar generations, very heavy elements are formed, such as iron and lead. ↑ The interstellar medium is the matter that exists between stars within a galaxy. ↑ An interstellar cloud is a denser-than-average region of the interstellar medium. ↑ Y.-J. Kuan, S.B. Charnley, H.C. Huang, et al., 2003, Interstellar glycine Astrophysical Journal 593 (2): 848-867. Retrieved May 30, 2008. ↑ L.E. Snyder, F.J. Lovas, J.M. Hollis, et al., 2005, A rigorous attempt to verify interstellar glycine Astrophysical Journal 619 (2): 914-930. Retrieved May 30, 2008.
International Astronomical Union, Dariusz C. Lis, Geoffrey A. Blake, and Eric Herbst. 2006. Astrochemistry: Recent Successes and Current Challenges: Proceedings of the 231st Symposium of the International Astronomical Union Held in Pacific Grove, California, USA, August 29 - September 2, 2005. IAU symposium and colloquium proceedings series. Cambridge, UK: Cambridge University Press. ISBN 978-0521852029. This page was last modified on 21 April 2016, at 16:03.